FMF time! Better late than never, right? Kate wasn’t joking when she said we were going deep this week! I get asked all the time if I regret quitting teaching when I did. “Maybe you just needed a break!” (I believed this one for awhile). And every time I nod along politely, but in my mind and my heart I know this to be true: I do not regret not becoming a teacher. Do I regret the timing? Absolutely. Who wants to discover their one dream wasn’t what you expected it to be the last semester of college and be forced to complete a bonus semester of classes they didn’t want? Not me! Do I regret not figuring it out sooner? Yes. I should’ve seen the signs much, much earlier. Though I was enjoying the practicums I’d done leading up to student teaching, it was still so stressful and overwhelming for me each and every time I got in front of a classroom that I should have realized I wouldn’t be able to handle it long-term. But I was stubborn and naive and determined to not let this dream go, mainly because I didn’t have another dream or career to fall back on. (time’s up here, but I ain’t done. Sorry Kate!). Do I regret not working with kids? Mostly. I love kids, I love working with them, but I am such a people pleaser that teaching students was hard because it’s hard to please kids when you’re trying to teach them. There’s no pleasing involved when you’re making them write essays and take tests. I miss it, though. I miss working with students. I started tutoring a few weeks ago, and it made me realize just how much I love working with kids, but the 1-on-1 aspect of tutoring is much easier than trying to make a whole mess of kids happy. I’ve considered other careers that will have me working with kids (librarian is the one I’m leaning to most), but teaching them is NOT one thing I miss! Do I regret not having a clue what to do next? Yep. I put all my eggs in one basket: teaching. All my ‘internships’ were education-based, all my skills are things I learned in my education classes. So to graduate with an English degree, but only having education experience was hard– though I have skills in editing and writing, I don’t have the internships or credentials on paper to back them up. I just have my education work, which will only help me find a job in education, it seems. Even when I graduated and got an internship at a place– guess what I did? Teach. I taught reading. Because that’s all I’m good at, apparently. I pigeonholed myself even further. 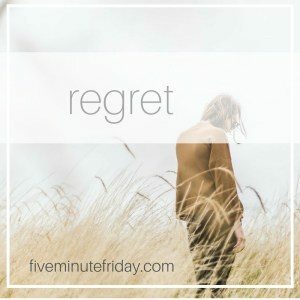 So, yes, I regret a lot about my decision and the circumstances that followed. I’m still unsure what my next steps are 2 years after the fact, and have no idea what my next dream or goal or career step is. It’s a hard place to be. I was nearing a mental breakdown if I kept going the way I was– and if that was what student teaching was like, how was I going to handle my own classroom? I wasn’t. I wasn’t going to be able to handle a classroom on my own. I know the answer to that question now. It’s caused a lot of heartache and struggle, but so much good has come from it too. I have no time to regret it– I’m too busy trying to figure out what my future’s going to look like, what the next dream God has for me is. My husband and I both went to Bible College. While I don’t regret a Bible education, it has made it difficult to find jobs. Somehow, we can only get ministry jobs. My husband is getting his second masters in Social Work. It took him a while to get to the place he knew what he wanted to do after we’d be cut off from our “dream job.” So, I feel for you. In my reading of Philippians 2 over the last week, I realized that Paul didn’t always know what was ahead. He made plans but put all his confidence in God. As I read your post, I thought of my realization: I can make plans (as best as I can with what I know while leaning heavily on God to give guidance), but ultimately I need to trust God’s working in and through me. Your revelation about teaching came when it did. God knew where you’d go. He’s got a plan of transformation into His image while, at the same time, leveraging it for his glory. Nothing’s lost with God., but it may take time to get where he’s leading.